"Heinstein's Dream is without a doubt the best torn and restored card I have seen. It's a real workable item!" "I have had this for quite a while now and can HIGHLY recommend it to anyone who want to add a T&R card routine to their REAL WORLD show. Of all the versions that I have examined over the years, Heinstein's Dream is the one that I currently use strolling/stand up. It looks very clean and is relatively easy to do!" "Heinstein's Dream is strong, visual magic that is practical and performable. 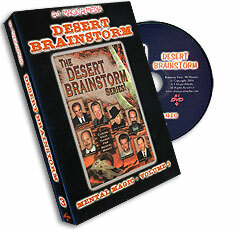 If you are looking for a real world torn and restored card effect Heinstein's Dream is the answer." "Heinstein's Dream blew me away the first time I saw it. It looks like real magic. The explanations are clear and easy to follow with no details left out. By far my favorite Torn and Restored card effect!" Heinstein's Dream is a clean, practical, commercial and easy to perform version of the Torn and Restored Card. Fine-tuned after more than a decade of performances, creator Karl Hein has developed a diabolical method for this classic effect. Heinstein's Dream allows you to adapt the same setup to perform 3 versions for maximum versatility: An instant flash restoration at the performer's fingertips, a powerful restoration in the spectator's hand and a visual piece by piece restoration. If you've been searching for a solution to this plot that is as practical as it is deceptive- look no further. Heinstein's Dream delivers!